For this Cleveland Indian fan, when #38 was found to be my latest ranking in the MLBlogosphere, I was relieved. I was anticipating a dropoff in the latest list and was pleasantly surprised to see a rise in the ranking for which I am very thankful to all of you. 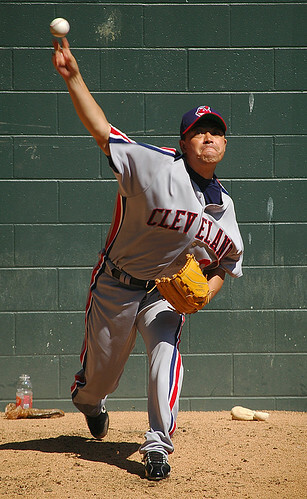 Speaking of relief, two prominent relievers, one past and one present both for the Cleveland Indians are whom this blog is dedicated today. The first started his major league career in Oakland in 1986. His name is Eric Plunk. Interestingly enough, he was dealt as part of a trade to the Athletics from the Yankees for Rickey Henderson. Years later, he would be part of a trade where he went back to the Yankees for Rickey Henderson. He was part of winning teams in his career in 1988 and part of 1989 with the World Series bound Athletics and in 1995 and 1997, both World Series appearances for the Tribe. On a little personal side note, I find it interesting that we were able to take a winner in Eric Plunk that New York gave up on and made him a treasure again. this year in key situations. His role reminds me of Eric Plunk, a person counted on to preserve leads and hold the opposition to not being able to take the lead. Time will tell if we obtain the same if not greater success with the arrival of Joe Smith. I look forward to seeing and/or hearing about him coming into make yet another appearance and hold yet another lead for the 2009 Tribe. His stats show a lot of potential and make me excited to see how it will pan out for Joe and the rest of the bullpen in 2009. Good luck to Joe and the rest of the Tribe as the bring some of the AZ warmth and sunshine back east in their attempt to shine in 2009. News from WBC, Camelback, and the anticipation of Wood and Smith made me feel warm as an Arizona day! The morning brought news that made me smile. The news broke that Choo and his Korean team would be part of the second round in the WBC as they won 1-0. Not only are they a rivalry with the two countries, there is a part of me that thinks the rivalry continues when Ichiro return to the Mariners and Choo to the Indians. the reason for this is listed here. Also was the news that last night De Rosa and the USA advanced to the second round with a win against Venezuela reviewed here. So, all in all, the Tribe’s week was starting off well. However these results were not going to help at a place called Camelback Ranch. Enter some potential and former WBC participants to pick up the slack. Grady Sizemore and Victor Martinez helped lead the tribe with other great performances from Andy Cannizaro, Tony Graffinino and Michael Brantley, the same one I thought of highly when he first arrived. Now we are on a winning streak. As meaningless as these Spring training games are, a win is a win is a win. Looking forward to games this week and who to watch for, Tribe fans have to be eagerly anticipating the debut of some Wood on Tuesday followed by a Smith on Wednesday. I wrote about them here. There is much riding on these contests. With God’s help and grace, these games can be a tuneup to an opportunity to shine like the sun for 2009, much like it does in the Arizona sky, mostly every day. Health for me and the bullpen is essential. I received a call today that I was sort of expecting that I was not exactly in the best of health. the test brought back the results I was expecting. Don’t worry readers, I will adjust my medications and diet and increase my exercise especially on this upcoming trip and be better in no time. However, to remain healthy will be a constant struggle and must be a refocus for me from now on. Luckily, I have the support and love and refound passion to make it happen! Let’s just say former Indians pitcher Jason Johnson and I share something in common. We both are Type 1 diabetics and have insulin pumps. Jason, throughout his career has been a role model for me. He now has a minor league contract with the archrival Bronx Bombers and is battling to be their fifth starter in Spring training. Its great to know that he is still an active player in the game. For the Tribe, health is going to be a recurring issue on and off the field especially for the pitchers. Eric Wedge added on Sunday that six of the seven pitchers are set and one of the pitching spots are up for grabs. In years past, the camp seemed like an all-out patchwork job but not this year! Kerry Wood, Rafael Perez, Rafael Betancourt, Jensen Lewis, Joe Smith and Masa Kobayashi were the six pitchers mentioned whose roles were defined. Still when one sees this group, it is great to see the acquired depth the Indians have to fill in given the injury history of last year for the Tribe as well as the tendencies that some of the pitchers show from their past. This depth is also great to see concerning the rotation and their injury history. If you ask me, for some of the other pitchers like Kobayashi, the adjustment to the major leagues caused him to have some difficulty. Betancourt also had some issues to struggle with. Joe Smith also has issues of switching leagues. This being said, Rafael Perez and Jensen seemed to be the healthiest of the bunch. Still it is nice to have depth and focus going into 2009 who like me want to turn things around and rise again to the top of the division and deep into the playoffs. I truly hope they do too. I look forward to seeing their progress in about a week. When rebuilding, Wood and Smith are good names to use. According to dictionary.com, the definitions of wood and smith are very fitting names for rebuilding. Wood is defined as the trunks or main stems of trees as suitable for architectural and other purposes; timber or lumber. Smith is defined as one who makes or works at something specified. Often used in combination: a locksmith; a wordsmith. In terms of baseball for the Cleveland Indians, Wood fits this definition because he has been deemed architectually sound and suitable to rebuild our bullpen so that the Tribe can return hopefully to where they were in 2007 and beyond, We will be knocking on Wood to close out ballgames. Hopefully, Wood’s intimidation factor and ability can be dominant as a closer because he is as good as they get when healthy. Still, it is nice to have the insurance of Jensen Lewis down the stretch just in case. Wood is not the only addition. Joe Smith, added to the Tribe in a trade earlier this week in a three team, twelve player blockbuster. He fits the definition of his name too as because he works hard at keeping the ball down and keeping his team in close games. This approach is one I enjoy because it creates the possibility for the defense to shine and have a lot of double plays and groundouts. With these two additions added from the Winter Meetings as well as the nucleus strong from the end of last year returning, the Tribe’s bullpen looks again like one to be strong once again in 09′ As I plan to say throughout 2009, the Tribe, with additions like these, has the opportunity to shine! Welcome to Joe Smith and Kerry Wood! Let the rebuilding and strengthening begin!